One of the big strengths of the App Store is its ability to provide users with concise and simple information from the Web in a neat iOS package. The latest is from Quebec-based Atomic Software, which wants to help you repair your bike while on the road. 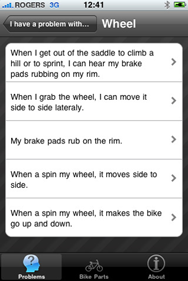 The logically-named Bike Repair, available for the iPhone and iPod Touch, provides users with a step-by-step guide to most common bicycle issues. Slipped chain? Need to change a tire? The app asks riders to select what part of the bike they’re having an issue with, then offers a variety of symptoms to choose from. The instructions include simple explanations of the solution, along with several high-quality photographs to show you exactly where and how you need to tighten that bolt. According to Atomic Software, no special tools (beyond a basic bike kit) are needed for any of these repairs. Bike Repair is available for $2 on the App Store and requires a device running iOS 3.0 or later.